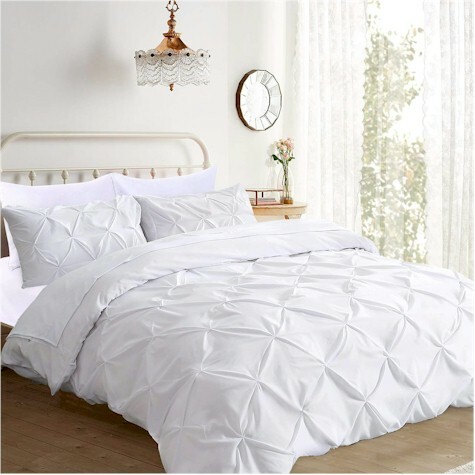 Amazon has got this 3-piece queen-size pinch-pleat duvet set in white for $32.99, but enter promo code 402X5KUT at checkout and that price drops by 40% to $19.79 with free Prime shipping. 3-piece queen-size pinch-pleat duvet set in gray for $31.99, but enter promo code 402X5KUT at checkout and that price drops by 40% to $19.19 with free Prime shipping. 3-piece queen-size pinch-pleat duvet set in dark gray for $32.99, but enter promo code 402X5KUT at checkout and that price drops by 40% to $19.79 with free Prime shipping. 3-piece king-size pinch-pleat duvet set in white for $35.99, but enter promo code 40A9BB5R at checkout and that price drops by 40% to $21.59 with free Prime shipping. 3-piece king-size pinch-pleat duvet set in gray for $36.99, but enter promo code 40A9BB5R at checkout and that price drops by 40% to $22.19 with free Prime shipping. 3-piece king-size pinch-pleat duvet set in dark gray for $37.99, but enter promo code 40A9BB5R at checkout and that price drops by 40% to $22.79 with free Prime shipping.